Terminal Croisière (where the big cruise ships come in) and crosses Port Hercule every twenty minutes. And at only 1 euro it's probably the world's cheapest charter and a fabulous way to get up close and personal with the mega yachts in the harbour. Never seen a solar powered boat before. Good choice for the theme day. That's a cool boat and environmentally friendly. This is a great post for public transportation with a unique Monte Carlo flair. I did not know such a ferry boat existed. Now, if only the boat could take you up the hills to either the palace square or the Casino square, then it would really be convenient. Dave, it pretty much does. It takes you to the far side of the port, below the casino - you simply get in the lift and you come out near to Casino Square. About three minutes! spendide tansport : les lunettes de soleil sont fournies ?? 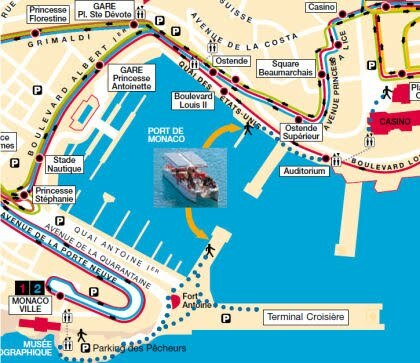 This is great: if I ever come back to Monte Carlo it would be for the boats! Great choice for today's theme. I'd take this form of transporation for sure! What a cool idea! I've never heard of a solar powered boat. Looks like a fun and cheap way to see the monster yachts in the harbor! I'd pay 1 Euro! This is a much happier shot than your Menton railroad/homelessness photo for today. Would love to be on it. Wow, that's cool! I had to make the rounds today even though I sat out this theme day. I completely lost track of the fact that today was the first! I always love your work, Jilly. Hugs from afar. Here they call its counterpart a duck. The difference between the franch and the english is everywhere. That's certainly a must for when we come and visit. Oh yeah, we want this here as well! Love water taxis. Such a civilized way to get around port cities! What a gorgeous post for today's theme ! Public transport at its best!! !